Designed specifically for kids, Children’s Multi liquid multivitamin is a great supplement to a healthy diet. Our children’s vitamins are an easy to swallow, great tasting, kid friendly liquid. In addition, this liquid multivitamin for kids is also one of the few sugar-free children’s liquid vitamins that is 100% vegan. Children’s Multi is a whole food daily liquid multivitamin for kids that contains all the nutritional goodness of the Daily Multiple without eleuthero or honey. This vegetarian dietary supplement contains essential fatty acids that are included to aid brain growth. Children’s Multi also contains elderberry and vitamin C for immune system support. Your kids will love this great-tasting formula. What’s in our liquid vitamin for kids? NO Artificial Colors or Flavors, Gluten, Milk, Salt, Soy, Starch, Sugar, Wheat, or Yeast. Folic Acid or Folate – Helps with tissue growth and proper cell function, as well as the break down and creation of proteins in the body. 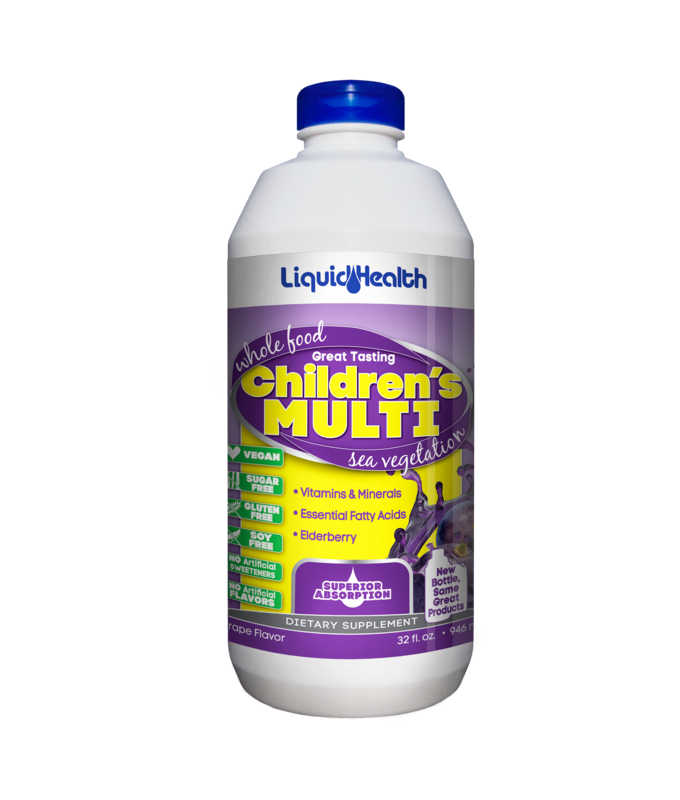 Children’s Multi is a liquid multivitamin blend of whole foods designed to provide the vitamins, minerals, trace minerals, and amino acids for growing bodies. We cold-press the aloe vera base, which leaves the nutrients intact and the enzymes active. In addition, Sea vegetables—dubbed nature’s perfect food—provide most of the vegetarian nutrients in this well-rounded formula. Stevia, a naturally sweet Paraguayan herb, is used for its beneficial properties. Our liquid multivitamin for kids is intended for use by children who eat whole foods and may benefit from a daily vitamin supplement. Vitamins for kids in a flavor they will love. Looking to buy children’s vitamins?